You are either going to love these or hate these. Social media reaction to them ranged from "Far too sweet for me", "Yuk, no, just no!!! ", "Why would you even do that!!!" to "OMG!!! Touched by Genius", "So weird, so good! ", "I need these in my life" and one of my favourites, "I'd be scared to try these incase I really liked them". 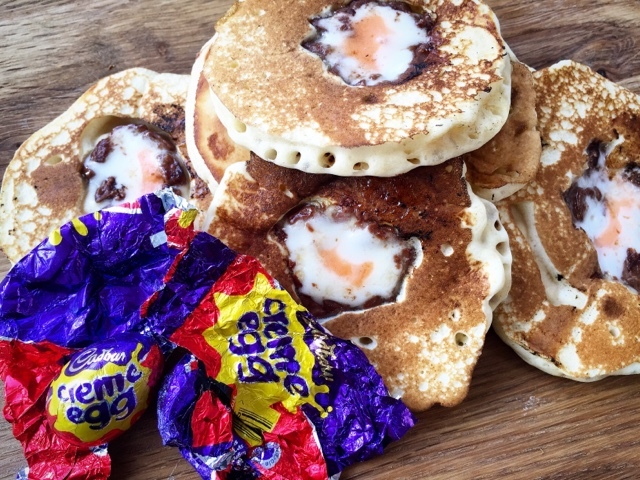 Cream Egg Bakes seem to have become a 'thing' in recent years and I've watched my fellow food bloggers create some real masterpieces incorporating them. Time for me to jump on the bandwagon. I actually wrote off my first attempt at Creme Egg Pancakes as a complete failure and lost cause as I thought they looked rather ugly. Social media said otherwise (most likes ever on on of my instagram photos) so I've tweaked the method a bit, made a second batch and here they are in all their glory. GIRDLE, n. A met. form of Eng. griddle, a circular iron plate with hooped handle, suspended or placed over the fire and used for baking scones, oat-cakes, etc. Places the slices on a sheet of greaseproof paper and return to the freezer whilst you make the pancake batter. Sieve together the dry ingredients and make a well. Add beaten egg and mix. Gradually add milk whisking well until you reach a dropping consistency. You may need slightly more or less depending on your flour and the size of your egg. Preheat a girdle or frying pan on the hob and grease with butter or oil. 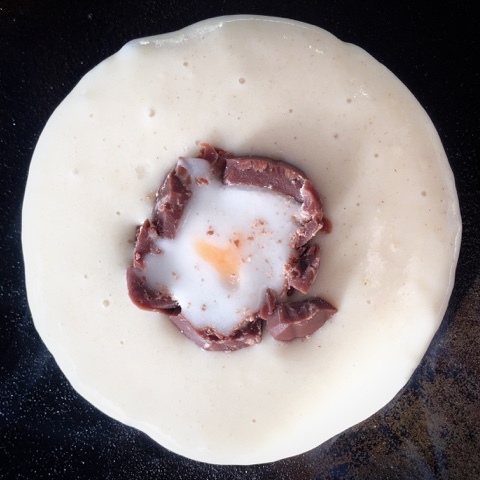 Spoon on the batter to the desired size and place a creme egg slice on top. Once the pancake starts to bubble turn over with a palette knife to cook the other side. Don't eat straight off the girdle as the creme egg will be like molten lava. Seriously HOT! If you're a Creme Egg fan there are selection of fab recipes below from fellow food bloggers which also feature the iconic Easter treat. How do you eat yours? Indulgent is definitely the right word for these! Fabulous twist on pancakes with eggs!! You definitely need eggs to make pancakes. Whether the need to be chocolate is a whole other matter! It's a win win situation for you! Little kids AND big kids! As long as you stick to one pancake these are not too sweet as there's only a slice of egg in each. 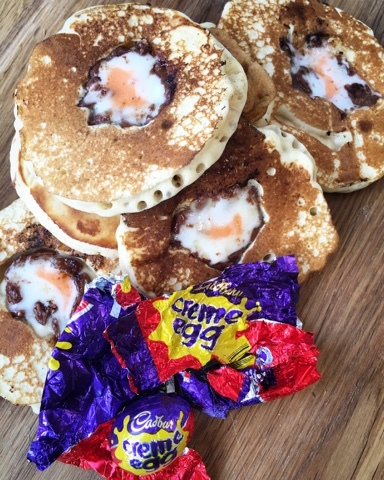 What an innovative way to use cadburys cream eggs. Thanks Nayna! So difficult to come up with something that hasn't been done before. 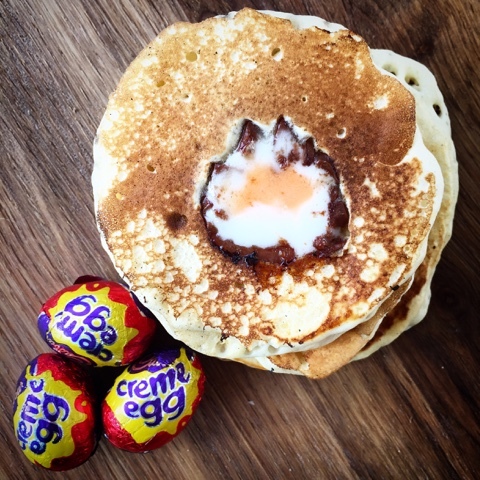 I certainly couldn't find any other Creme Egg Pancakes out there. I need these tomorrow morning!! Well, it is half term here... Can't wait to try them. Thanks for including my recipe. It's half term here too so I reckon that's as good an excuse as any to indulge. Thanks Danni, indeed they are! Thanks Angela. Its not often I have brilliant ideas! I think I'd actually struggle to eat a whole one these days but a mini one or a slice of one in a pancake I can definitely manage. Good luck with the birthday cake! 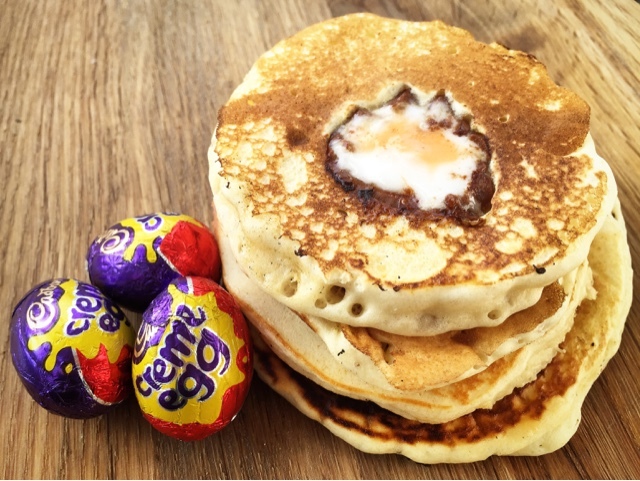 We like pancakes, we like creme eggs - so we are all over this one Claire. Exactly! What's not to like?! Now you say it I think they might be even better with Caramel Eggs! Someone else suggested doing them with Caramel Eggs and I reckon they would work equally well. These were one my to make list but now I will have to rethink! They looked a little bit more 'rustic' that I hoped but do taste fab. Would you believe that Creme Eggs have been in the shops since the start of January. Easter comes early! Creme Egg Bakes are indeed a social media sensation and I am indeed guilty of jumping on the bandwagon!